The Fort Scott Area Chamber of Commerce Announces the Holiday Open Houses will be held this Thursday, November 8th from 5 pm to 8 pm. Retailers in the downtown historic district and other locations throughout town will be open late for you to shop for gifts and holiday decor. Many of the locations will be offering drawings, festive treats and beverages for you to enjoy. 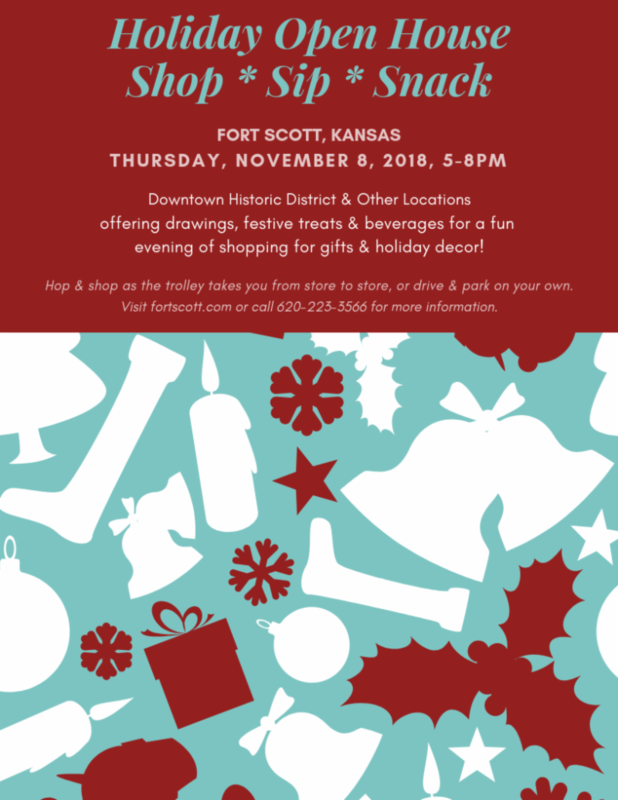 This will be a fun night of shopping local that you will not want to miss, as over 20 merchants offer ideas for Christmas decorating, gift-giving and stocking stuffers with unique finds. The Chamber of Commerce’s “Dolley The Trolley” will be giving rides to and from the different shopping locations so you can hop and shop!